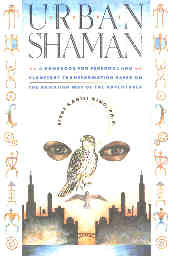 In this book, King uncorks a potpourri of Hawaiian techniques for use by undercover shamans in western cities. The Hawaiian names of the techniques are a bit hard to memorize, but the techniques are simple and straightforward and easy to perform. They involve energy flow and intention with the occasional assist by some physical object such as a 5" rod metal, a crystal, or a shaped piece of wood. One learns how to heal using one's hands by placing them in two primary positions on another's body. King is careful to point out in the use of physical objects that the intention is more important than the object selected. His use of kekui seeds is a personal preference because the confidence he feel when using them strengthens his intention. King describes a clients's quests with a hawk as his companion. The last quest was memorable to me. "At last I understood and tore the sign in half and took both the eggs. In one was a moon that represented Love, and in the other was a sun that represented Power. I brought them back to my Garden, put them away, and thanked my hawk and sent him back to Lanikeha. Finally, I came back to my normal awareness and symbolically placed a spiritual form of the eggs into each half of my brain so I would remember to use Love and Power together." What impressed me in 1991 was the altar's question, "Who Dreams the Dream", which inspired me to write this poem which later found its way into my book, Rainbows & Shadows. So the dreamer took both eggs! Like Alexander cutting the Gordian Knot, King's client cut through the interwoven interconnections of rules and meanings and did what he wanted to do. What impressed me in 2016 as I added the above passage to this review is the idea that one should use both Love and Power together when deciding on a plan of action. This is what Alexander did as he roamed the known world, bringing Love and Power to all the peoples he met. It was the gift to them of Love and Power, rightly understood, which conquered them, filling them with respect for Alexander! Here is the poem I was inspired to write called "Who Dreams the Dream". It appeared in my book of poems, "Rainbows & Shadows", and is also published on-line in DIGESTWORLD ISSUE DW171. Remember: Who dreams the dream? With each exercise he gives examples of how he has used them in his training classes. Some of the experiments are farfetched to the linear, analytic, scientific mind, but they resonate with the concepts of modern quantum physicists, such as Wheeler and Boehm, and the writings of Jane Roberts. King's group effort to move the path of hurricanes matches the concepts detailed in The Individual and the Nature of Mass Events, a book by Jane Roberts. King explains crystals, pyramids, orgone boxes, magic wands, laying on of hands, and many other arcane areas of humans interacting with their environment for which scientists have yet to agree on explanations. This is a how-to book that would be best kept at hand to use in everyday situations. The individual exercises could be split out on index cards and put into a recipe file for surviving in the modern world by use of time-tested techniques of Hawaiian shamans.